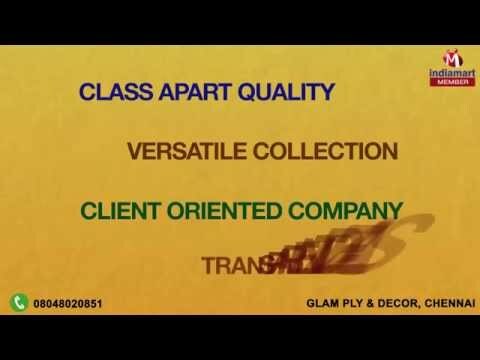 Welcome to Glam Ply & Decor, established in the year 2014, we are the trusted and prominent firms of the industry actively engrossed in trading and wholesaling a quality approved array of Plywood Products. ffered products are fabricated and designed in full tune with the set industry guidelines by taking best quality basic material. Under this impeccable collection of products we are providing optimum quality Plywood Products, Marine Plywood and Vaneer Plywood. Our offered product is highly admired across the market for its long time shine, flawless finish and accurate dimensions. Moreover, we are providing these products in various stipulations. We are offering these products as per the precise demands and needs of our clients. For this objective, we have huge number of authentic vendors in the industry. We have searched these vendors after deep research the quality of their offered products. Our vendors are able to deliver the bulk demands in committed time period.